Was it the hike itself, the early morning sunlight or the small window we were hiking to in the rock wall? All seemed like windows in which to experience the wonderful nature therapy offered up in Bryce Canyon on a sunny spring morning. Thanks, it is a marvelous area to visit and just to spoil it the view out the hole was just as good as the view into the hole. Beautiful shot. Have been to Bryce Canyon a lot in my life. It is a fantastic place to visit. I am sure you enjoyed that hike. HI, yes it is a great place and we did have a fun hike that morning. Hope you are having a wonderful day. Thanks, hope are your days are wonderful. Hi, yes today has been a great day so far. Sun is out so I can’t complain. Just great, what a wonderful place that must be, I love the inclusion of the little tree in the snow. Hi Paula, thanks. I like the snow just as much s the tree. Just a bit left to demonstrate it is spring but just spring. I’ve been to Bryce Canyon twice. One of my favorite places. The blueist skies I’ve ever seen, set against those red rocks. Just stunning. Thanks, yes it is a great place and I hope we can get back sometime soon. Have a great day and thanks for the feedback. Lovely words, lovely photograph. Love this post. Love Bryce Canyon. Thanks, Bryce is a fun place to visit and we really enjoyed that hike and are glad our photo struck a chord with you this fine day. Hope all is going well. Bryce Canyon!! Great photo of this majestic place! Thanks Amy, wishing you a wonderful day. I wonder, what did you see through the window? Not to let the cat out of the bag but the view was a good as the view from the front side. Have a great weekend and hope you get a chance to get out and enjoy the outdoors. I love all the lines and angles in this shot and that window is just the coolest thing! Hi Eliza, Thanks. The shadows did create a nice view that morning and very interesting as you noticed. Hop your day is gong well and have a great weekend. Wonderful composition and a stunning location, Mike. 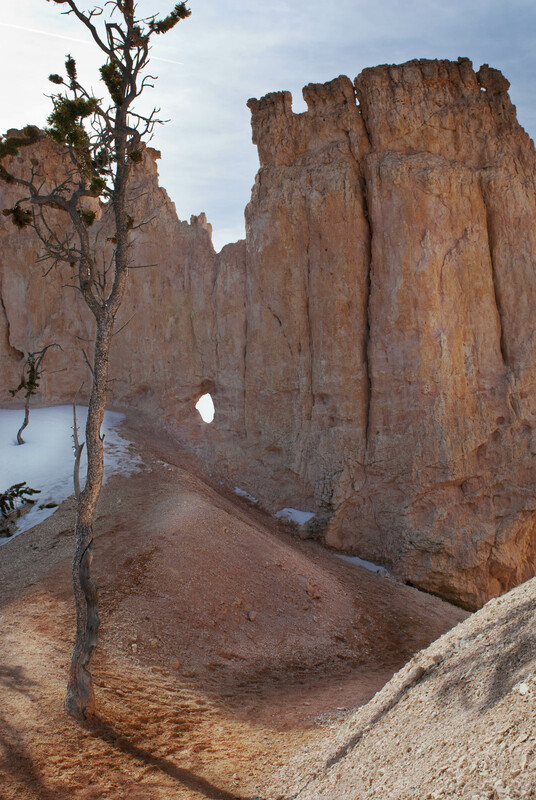 I visited Bryce Canyon many years ago, unfortunately I didn’t get to go on any hikes. Will have to revisit one day, go hiking and take lots of photos. Hi Simon, hope you get back one day and also have time to explore the lesser know but equally wonderful area in southern Utah. Hi Jane and thanks. Bryce is a fun place to explore and I really like those long shadows. Hope you are having a great day. Thanks Jet, a wonderful place. HI, it was indeed a peaceful morning hike. Hope your day is going well and wishing you a wonderful week. Not a bad day, Hope your day was good as well!